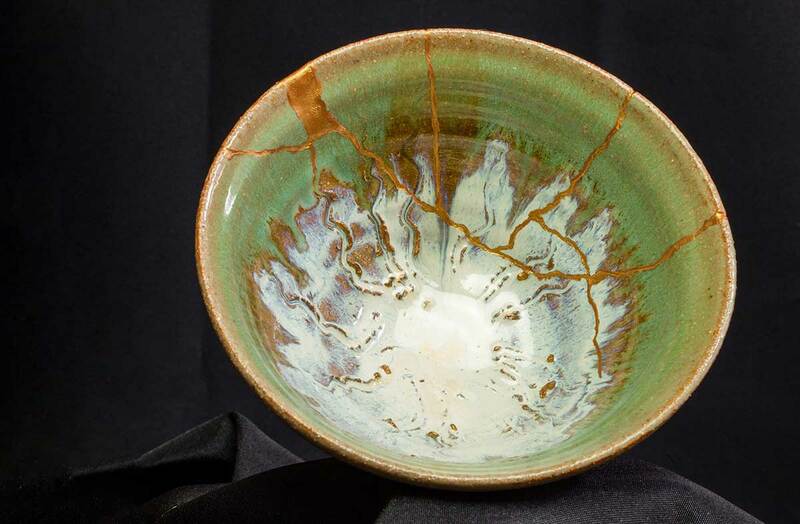 This once-broken bowl was repaired using Kintsugi. What does it mean to be fully present, both at work and at home? How does the quality of our presence impact our happiness, our relationships, our resilience and our sense of peace? Can be free of anger, aggression and urgency. Can be unattached to and unconcerned about either success or failure. Discover clarity, energy and resolve. Experience patience, faith, peace and bliss. As you might be thinking, finding peace in the present isn’t always easy. In fact, for many of us (especially if we’re high achievers with perfectionistic tendencies), finding peace can be extremely challenging. The good news is a variety of lenses are available to help us explore the power of presence. We’ve talked about several of them — like centering, mindfulness meditation and improvisation — in previous columns. One thing we haven’t explored in much depth is the idea of wholeness. A recent read of “On the Brink of Everything,” by Parker J. Palmer, impressed upon us the fundamental importance of wholeness as a starting point for finding peace in the present. On page after page of his book, Palmer makes his case for the benefits of recognizing our inherent wholeness. Wholeness, he says, does not mean perfection, it means embracing brokenness as an integral part of life. “Being human means being broken and yet whole. The word integrity comes from a root that means ‘intact.’ At bottom, it has to do with being ‘integral,’ whole and undivided — which means embracing our brokenness as an integral part of life. Everyone has a shadow, even high-minded people like us. Especially high-minded people like us! But when you are able to say, ‘I am all of the above, my shadow as well as my light,’ the shadow’s power is put in service of the good. When we reflect on the truth of these words, we’re reminded about the Japanese art form of Kintsugi, which involves repairing broken pottery with lacquer dusted or mixed with powdered gold, silver or platinum. As a philosophy, it treats breakage and repair as part of the history of an object rather than something to disguise. When restored, the piece is actually more beautiful for having been broken. We, too, can accept and even embrace our flaws and imperfections instead of trying to hide them. It’s only then that we can be truly whole. As veterinary professionals and members of one of the healing professions, we must realize that we are all wounded healers. Coming to terms with our own complex mix of darkness and light will require us to tame our ego and exercise self-compassion and self-forgiveness. According to Dr. Kristin Neff, associate professor of psychology at the University of Texas, “Research shows that the No. 1 barrier to self-compassion is fear of being complacent and losing your edge. “It’s just the opposite,” she says, meaning that self-compassion can lead to greater achievement than self-criticism ever could. This is, of course, easier said than done. But core to self-compassion is to avoid getting caught up in our mistakes and obsessing about them until we degrade ourselves, and rather strive to let go of them so we can move on to the next productive action from a place of acceptance and clarity. Make the choice that you’ll at least try a new approach to thinking about yourself. Commit to treating yourself kindlier. Call it letting go of self-judgment, going easier on yourself or whatever resonates most. Try any type of practice, like mindfulness meditation, that helps you stay in the moment and, without judgment, notice what it feels like to get caught up in self-criticism. See how painful that is compared with being kind to yourself. Validate the emotions you’re experiencing without adding fuel to the fire. Interrupt the spiral of negative self-talk by focusing your energy on something external that you care about, which can help you establish perspective and a sense of meaning beyond yourself. Take a break and find a puppy, kitten or your own four-legged buddy to love on. Here’s a potential game-changer question for you: Are you willing to forgive yourself for your shortcomings? How can you stay out of judgment and be more accepting of your shadow side while still remaining true to your best self and responsible for your impact on others? Mindfulness expert Sharon Salzberg advises us to open our perspective and hearts and practice generosity with ourselves. She suggests, “If we’re always looking for some object or person or thing to create a sense of completion for ourselves, we miss entirely the degree to which we are whole and are complete in every moment.” Spaciousness and peace can be found within ourselves. We pay a cost when we dissect ourselves into parts, some of which are “acceptable” and some of which remain locked up and hidden. Whether we’re repressing our perceived faults or even overlooking or downplaying our positive qualities, the result is a decreased level of aliveness, energy, creativity and authentic expression. 1. Pause and take a moment of presence. When you feel something arising in you that’s unfamiliar (or very familiar yet unwanted), pause and take a moment of presence. Try to tune in to what is trying to be known in some way within you. Sometimes that’s all that’s needed to have a little energy boost. 2. Make space for all voices. When you’re under pressure, notice in the moment the urge to distance yourself from a certain aspect of yourself. Be aware of having self-judgment. Instead of creating distance, invite and allow space for that part of you to actually emerge more fully, acknowledging it with kindness, compassion and love. You might be surprised at the wisdom available by giving these different perspectives some airtime in your consciousness. You can then choose what’s next with more awareness. What’s your relationship to those parts of you that seem distasteful, or are not welcomed into your identity? How would you like this relationship to be? What parts of you (shadow or gift) might need a home within you now? What do you imagine would be some possible outcomes (both scary and enlivening!) from including more of you in your work, your life? How might including more of you serve your relationships? We leave you with this poem by Rumi, one of the most frequently recited poems in mindfulness retreats and courses around the world. The most important thing we can do to discover inner peace is to show up as our true selves as often as we can. As Brother David Steindl-Rast says, it’s vital to be fully present in the moment and to be present with all we have, aware of our shadow as well as our light. It’s only when we accept our own wholeness, possessing a sense of worthiness and dignity, that we can extend acceptance, compassion and forgiveness to others.